Wiener Schnitzel is a classic German dish that originated in Wien or Vienna, Austria. Although it’s not typical fare at Oktoberfest, it certainly has its place on every German table. We decided to do a bite size variation so that our guests could enjoy it without filling up on the real deal. Traditionally Wiener Schnitzel is made with veal, but the use of pork is also common. Choose a 1/4″ cut of pork loin, and use a meat tenderizer or mallet to flatten it out. Dredge the meat in flour, egg, and seasoned bread crumbs. Then place it in a skillet with hot vegetable oil and fry until golden brown on both sides. Spritz with lemon and serve. Guten Appetit! 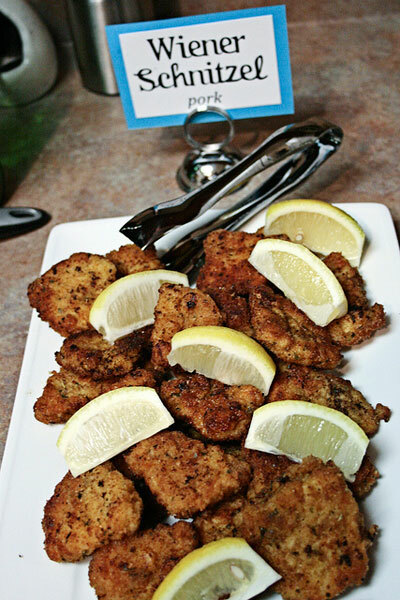 Here’s an idea, instead of chicken nuggets try making these easy and delicious Schnitzel bites.